Class 7 children had another good day. In the morning we enjoyed exercise and calming with Class 4. The children sang along to the exercise music with lots of energy. After our class morning meeting we had graduation practice. All the seniors gathered on the first floor to practice the first few sections of graduation. Class 7 children showed Class 8 and 9 children hoe to receive their graduation certificates. Class 7 did very well. After graduation practice we returned to our class and made one more page of our picture books. The children wrote part four of their stories in English and then drew nice pictures to go along with the words. I like the stories a lot. The picture books will be nice reminder of their time here at IYK. After picture book time, it was time for lunch. 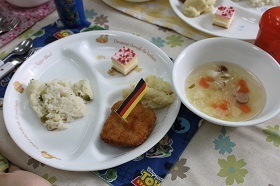 Today was world lunch and the country was Germany. We ate yummy pork and potatoes, with cake dessert. After that we had playtime and some group phonics activity. A wonderful day!